Three new wearable devices with OLED displays were unveiled at the MWC tradeshow today. The most interesting one is Huawei's Watch - an Android Wear device that sports a 1.4" 400x400 (286 PPI) circular AMOLED display. It features a heart rate monitor and fitness tracking, six-axis motion sensor and a barometric sensor. 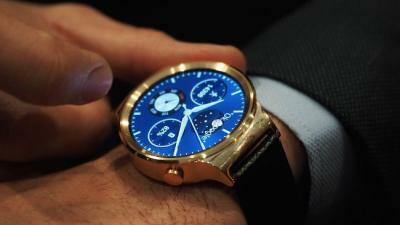 Huawei's Watch will ship "in the middle of 2015". 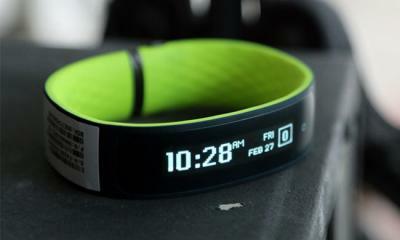 Another interesting device is HTC's Grip - a fitness tracker that was developed together with Under Armour. The wearable device sports a curved monochrome (white) PMOLED display, which seems to be Futaba's 1.4" 128x16 film OLED (similar to the one used in Garmin's Vivosmart). The Grip includes the usual range of sensors in addition to an internal GPS chip.The Grip will ship in the US in the spring for $199. Finally we have Acer's Liquid Leap+, which is a smart fitness tracker that tracks your activity and sleep cycles. The Leap+ uses Bluetooth to communicate with your iOS, Android or Windows Phone and it sports small 1" white PMOLED display. The Liquid Leap+ will ship towards the end of March 2015 for $88 in Europe.